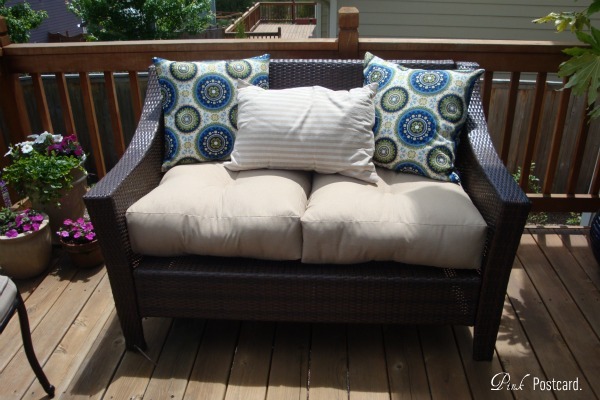 deck furniture, new pillows...and, "wait officer, I can explain...."
First off, a big thank you to Tip Junkie for featuring the Spicy Sweet Grilled Ribs I posted a couple weeks ago! There are lots of fabulous variations on ribs over there today! Our back deck has been getting a new look over the last few weeks. 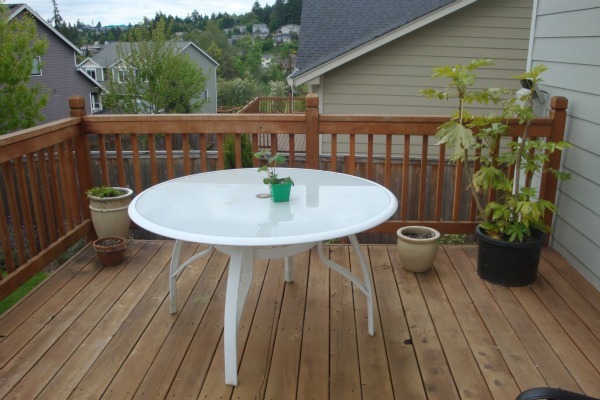 Since last summer I have been thinking about having more of a seating area rather than a table and chairs. My husband hates eating out here. He feels like he's on display for all the neighbors to see. We do use it for entertaining though, so I have been working on getting this into a dual use area. I scored some amazing deals- let me show you what I've been up to! First off, I found this Target wicker love seat at Goodwill for $52.99. It's currently being sold in stores for $249.99! 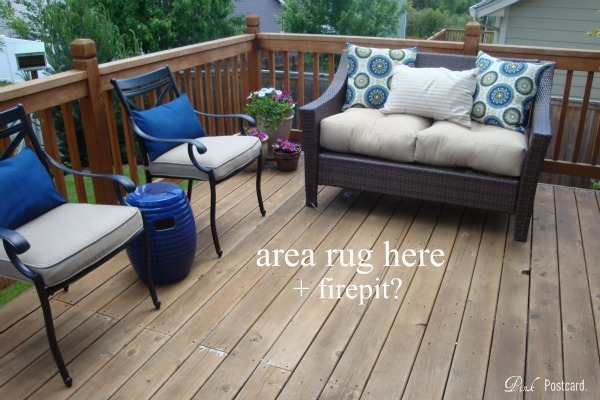 It was missing the cushions, and on the left leg, a strip of the wicker was coming loose. For $52.99, who cares??! At the same trip to Goodwill, I found these two Smith and Hawken chairs. $24.99 each! I think these are also currently being sold at Target for around $60 each. These did have the cushions included! Nothing wrong with them, store tags were still attached. I was on such a high from my AWESOME deal at the Goodwill! In fact, I was in la la land while I was driving home, drove right through a stop sign, with a cop right behind me. Can you hear my 'deal' whistling out the window? Me too. I was so mad at myself!! Do you know how much a ticket is for running a stop sign? Fortunately I have a great driving record, and was able to get it reduced by going to court last week. Still not great, but better than the amount I thought I'd have to cough up. I went to work over the weekend making pillows for the seating area. 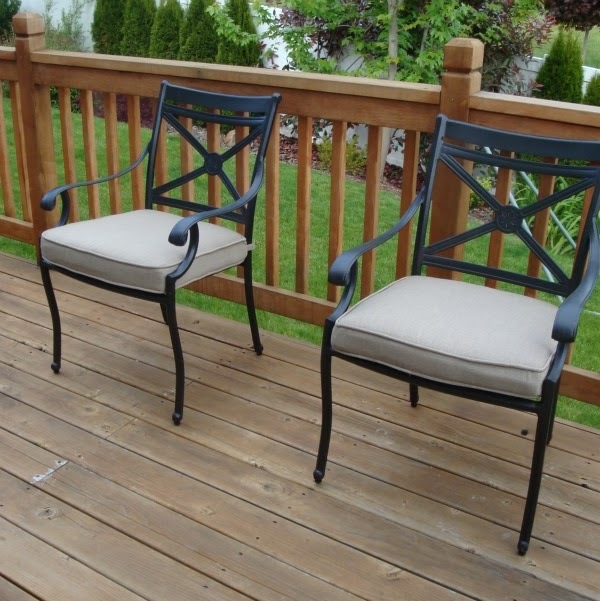 The seat cushions were from Costco- they are actually outdoor floor pillows, but they are nice and fluffy, and at $19.99 each, it was a great deal that fit! 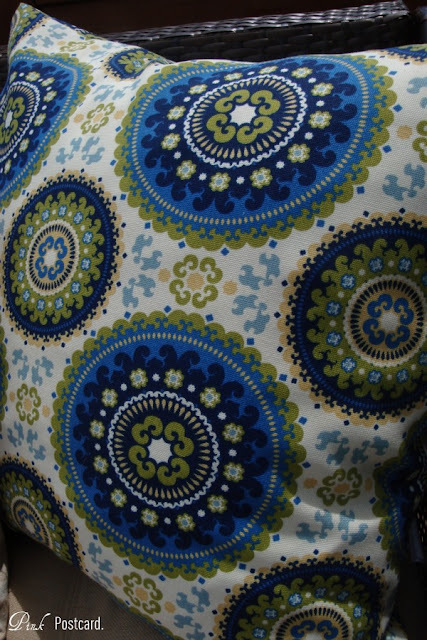 This gorgeous fabric was on sale for $6 per yard! 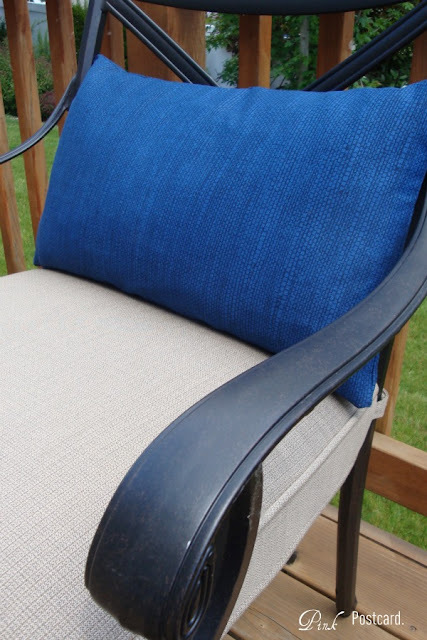 Outdoor, 54" wide decorator fabric! I have never seen anything this good in price ever. Water resistant, fade resistant. This was covered over a nice, big, squishy thrifty store pillow that I got for $5. I did buy one pillow form- it was on sale too, so it was only $9. The linen striped pillow was also at a thrift shop- it's not in outdoor fabric, but I liked the shape of it and the stripes. It was $5. I just bring it in when we're not using it. This pretty blue fabric is also weather resistant, was on sale 50% off, so I got a half yard to cover two matching thrift store pillows. Total cost? $10 for two. The cute little garden stool was at my grocery store for $34.98. I don't think I've ever seen one priced this low! It needed to come home as a side table for the chairs. This large plant was from my sister in law. She was moving and couldn't take it with her. Free! The pot was purchased from the grocery store also- $25. Most of these ceramic pots- especially large ones are usually double in price. 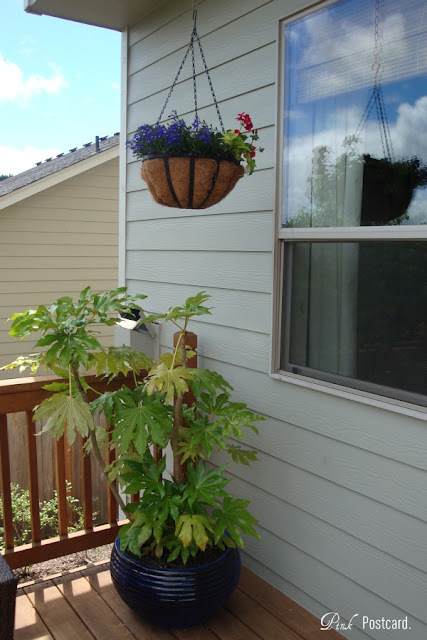 The hanging baskets were from a friend's garage sale- $8 for the pair. I filled them with flowers that will eventually cascade over the sides through summer. I'm happy that we are getting a beautiful area on the cheap! There's a lot more to do, but this is where we're at now. We plan on adding some privacy soon. 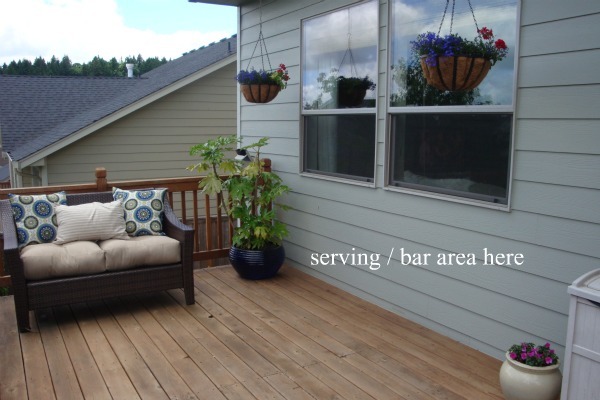 Porch, Deck and Patio linky party here on Wednesday June 22! Oh my goodness the transformation is fantastic! It look so great, particularly loving the cushion fabric and that wicker sofa. Wow! what great deals you found. That outdoor sofa was an incredible deal and the chairs too. Everything you bought were bargains and it all looks so great together! Love it all. lovely lovely....some day when we have a back deck area that's bigger, i can add some seating. you are doing such a marvelous job. Get the cocktails ready.........I'm coming over! I can't believe that you got such wonderful deals at Goodwill! 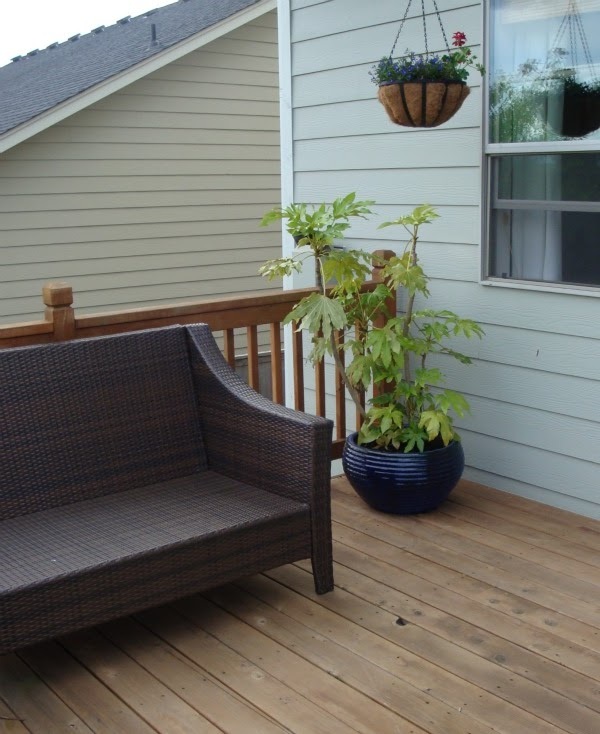 Your deck looks gorgeous and so inviting! Oh I love the space! It looks so comfy! Great job! I'm with Val- Im ready for some cocktails! Those are great deals and they look fantastic.Sorry about the ticket, but even that can't take away the thrill of finding great stuff at the thrift store. Wow-awesome deals- except for the ticket! Love all the blue - so pretty! To bad about the ticket but at least they reduced it for you! 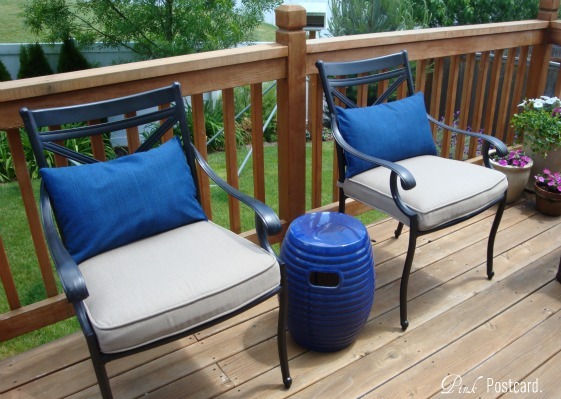 Love what you are doing to your deck, so love that blue that you are using! What a great thrift find. I can understand why you were elated. They look fabulous. I have been there with being so happy while driving and getting pulled over. Urgggh!!! I am glad they lowered the ticket for you - still upsetting as your are trying to save money. Denise I can't believe you scored those chairs at a thrift shop - nice! Loving the blue out there - what a great space! What a great space you've created. Your deals are almost unbelievable. I would have been running stop signs,too! Love your choice of colors and fabrics. wow!! fantastic transformation!!!!! great finds! that's funny about the stop sign though- yikes!